Located in the heart of Hobart, Hobart Mid City Hotel provides motel/hotel acccomodation with all of Hobart's attractions easily accessible. Complimentary off street car parking available. Stroll around Hobart CBD and the waterfront precinct, visit famous Salamanca Market, and check out the views of Hobart city from Mt Wellington. So much to see, stay that little bit longer and pay less. 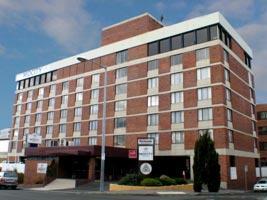 The Hobart Midcity Hotel is close to everything that Hobart has to offer and features numerous guests facilities including lounge bar, free car parking, guest laundry, lift, restaurant, room service, tour desk, airport shuttle and 24 hour reception. Food and Beverage Options. . Whatever your taste, we offer a option to suit everyone. Midcity Bar & Cafe on the ground floor featuring food facilities open 7am till 9. 30pm and bar facilities open from 9am until late, 7 days a week, with the best coffee in Hobart. Alternatively you may wish to try your luck on our gaming machines or play a game or two of Taskeno. . Nearby Attractions : Historic Battery Point and Salamanca Place which is home of the Saturday Market. The city and waterfront with its array of shops and restaurants. The majestic Mt Wellington which offers the best views of Hobart and its surrounds or for a closer view of Hobart try Mt Nelson with the historic signal tower. For chocaholics Cadbury's and its delicious tour is a must. A visit to Hobart should also include a ferry ride on our magnificent harbour. Hobart is also a perfect base for many day trips including the Huon Valley, the infamous Port Arthur Penal Colony, Lake Pedder, historic Richmond and many other attractions. Double & Single Room : Sleeps up to 3 guests on 1 Double & 1 Single Bed. Family Hotel Room : Sleeps up to 4 guests on 1 Double & 2 Single Beds. Studio Hotel Room : Sleeps up to 2 guests on 1 Double Bed. Superior Hotel Room : Sleeps up to 2 guests on 1 Queen Bed Or 1 King Bed. Twin Hotel Room : Sleeps up to 2 guests on 2 Single Beds.